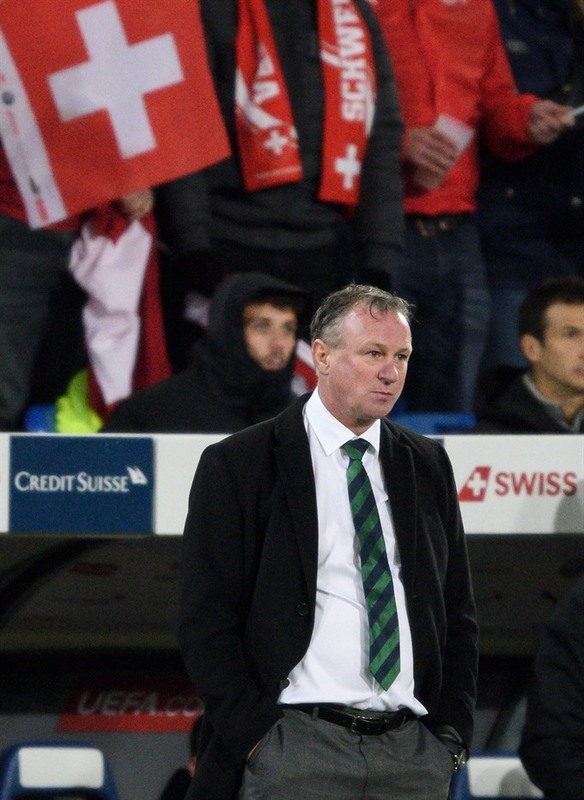 PARIS — Northern Ireland manager Michael O’Neill bemoaned the controversial first-leg penalty that saw his side’s World Cup dream end with a 1-0 aggregate defeat by Switzerland in their play-off on Sunday. Ricardo Rodriguez’s spot-kick in Belfast on Thursday proved the difference between the two sides, as the Swiss held off some late pressure from the unfancied Northern Irish in the second leg at Basel in difficult conditions after heavy rain. O’Neill said his players would still feel hard done by, after the decision from Romanian referee Ovidiu Hategan to award Switzerland a penalty when Xherdan Shaqiri’s volley struck Corry Evans on the shoulder from point-blank range. "Ultimately we’ve gone out to a poor decision in the first leg," he told Sky Sports after the second-leg 0-0 stalemate. "If it wasn’t for the penalty we’d be playing extra time. They players will be remembered for the performance tonight. "It’s a very sore way to lose. We have to move on." Despite the controversy surrounding the winning goal, which saw Evans have to apologise for his wife’s rant on Twitter in which she called the referee a "Romanian gypsy", Switzerland were the better side over the two legs as they booked their spot at a fourth straight World Cup. Vladimir Petkovic’s home team wasted a host of chances in the first half, with striker Haris Seferovic most to blame, but did enough to get over the line as Rodriguez cleared an injury-time header from Jonny Evans off the line. "Everyone said it was almost done, but against teams like that it’s a fight. I’m very excited we’ve achieved our goal," goalkeeper Yann Sommer told television channel RTS. "It’s unfortunate that we were not more efficient because it would have been easier." "It was a difficult match. It was very difficult to play with the pitch and our opponents," Stoke City winger Shaqiri said. "I’m very proud that we have managed to qualify for the whole country." It was only the second time in the qualifying campaign that Switzerland had failed to win, after finishing second to Portugal in Group B despite winning nine of their 10 games. Croatia were barely made to break sweat as they eased into the World Cup finals for the fifth time with a goalless draw in Greece. A 4-1 first-leg win in Zagreb had done the damage on Thursday, and the Greeks never threatened to produce any sort of a comeback. Croatia, who sacked coach Ante Cacic last month as they finished behind Iceland in Group I, won their final qualifier against Ukraine 2-0 under new boss Zlatko Dalic just to reach the play-offs. But the 1998 semi-finalists are now into their fifth finals from just six attempts, giving the likes of Luka Modric and Ivan Rakitic the chance to make up for their group-stage exit in Brazil three years ago. Italy welcome Sweden to the San Siro on Monday needing to overturn a 1-0 deficit to avoid failing to qualify for the first time since 1958. Gian Piero Ventura’s side find themselves under massive pressure, with the veteran coach drawing extra criticism after claiming he was "amazed people are surprised we’re in the play-offs" after being drawn in a group with Spain.